Taking my table saw to the next level: Correct segments straight off the saw! OK, I got into segmented bowls, vessels, and vases this year as a new product for my galleries. I did the wooden sled thing, and it worked, sort of, with four different angles developed for the sled. But after about 100 cuts, I started to notice that things were working their way out of true, and decided that the wooden sled route was just not going to cut it for me. After much debate in my mind, and my wife asking when am I going to pull the trigger, I finally settled on the Incra 1000HD Miter Gauge and the Incra Miter Express sled over the Kreg miter gauge, as a way to more permanently develop a way to get finished angled segments “right off the saw”, no “inching”, no “edging” my way into a true circle of segments. A lot of the books I had bought, to train myself in this skillset always talked about inching or edging their way into a complete set of segments with no air in the mating surfaces. In other words, lots of minor sanding. Hooie on that! It seemed to me that most of these books were written before 2004, some as early as 1995. I did admire the total talent of people like Malcohm Tibbetts, Ray Allen, Don Jovag and Ralph Buckland, but in the end, I felt that they all were a bit out of date, and having to sand segments to get them into a true, air-tight circle should be achieved right off the saw. That was my quest, mainly for time and efficiency. So after setting up the Miter Express sled, the first thing I thought was that the “drop sled” portion had to go. I wanted a way for the segments, immediately after cutting, to fall off and be able to get them out of the way. I use a pencil eraser on a pencil. To get my length right, I simply took off the drop off sled portion of the Miter Express, and added a short block (trued square) of soft maple with two magnets inserted into the bottom. I put this against the fence, and simply measure, (up to 1/64th of an inch), how long my segments should be in relation to the outboard edge of the blade. You can see that in picture three of this review. Once I have my length, I simply set up my miter gauge to the proper angle and make sure my fence is not going to interfere with the blade, and use the block, now moved to the lower part of the secured fence, set my length, and cut. That is shown in picture two above. 1. 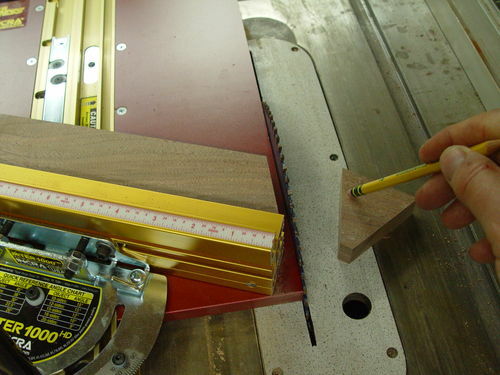 First thing, and this is IMPORTANT – is your blade absolutely, perfectly parallel to your miter slots? If not, all this is vain. I did the following, (no picture shown). I held a plastic framing square in the miter slot edge and measured with a calibrated rule from the miter to the front of the blade, then to the back of the blade. They were within one painted 64th line on the ruler of being perfect. Something like 1 thousandths of an inch or better. Good enough. From there, I could set up my Miter Express and my Incra 1000HD and know that my miter slot was parallel to my blade, a critical measurement that is ignored by the instruction in the Incra manual, but to me is the baseline of everything. Incra tells you to measure to the blade – WRONG – you need to know that your miter slots are totally parallel to the blade before you set this up. Once I had things where I wanted them, I did a test segment circle of 8 segments, and was off a bit. I realigned my miter gauge and tried again. This time, I had one segment that had about 8 thousandths of an inch of a gap, the total out of tolerance off of all the segments, but still not good enough. I once again aligned my miter to the blade, and sure enough, found that I had one side of the miter on the edge of a carbide cutter on the blade, not on the blade body. We’re talking a couple of a thousandths of an inch here from success to junk. I corrected things, and tried again. 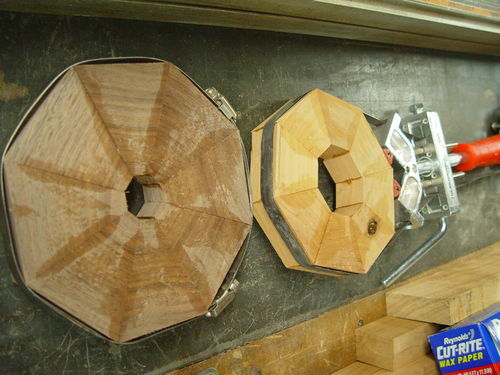 Success…the 8 segment ring I cut was dead on, no air anywhere, 3/4” thick cherry. I was a happy camper. Now that things are set correctly, I can pound out segmented rings way faster than ever before, and I am very, very happy with this setup. Completely worth the money, if you are serious about segmented turnings. I highly recommend the Incra 1000HD, and the Miter Express as a combo unit that will give you segments you cannot believe, once set up. If you need bigger cuts, I believe Incra sells a larger sled, but for me, and my humble Rigid 4512 saw, this is just perfect, and I hope to pound out rings about as fast as I can glue them up, get them on the lathe, and get them where I want them, in a beautiful bowl, vase or vessel that I can sell and be proud of . I have two galleries waiting, time to get to work! I’ve had mine since they came out, and use it for everything but what you use yours for. Love it, and honestly love anything that I’ve used of Incra, including my TSLS 32 on my Craftsman contractor saw. Just can’t go wrong with the accuracy. I have had two good miter sleds. First the “Dubby” and now the Osborne ( http://osbornemfg.com). The latter is fabulous. It is triangulated, so rock solid; was dead accurate out of the box; has a very long extension arm; and is easily reversible to work either left or right handed. I don’t know why people bother making sleds since many of the current miter offerings are so versatile. I looked closely at the Osborne. I found numerous reviews about that triangulated third arm – the connections they now use for it. People complaining about play showing up in those connections. Obviously you have had great success with yours. And I agree – after building two sleds over the years, and having them both gain slop over time, these pro units are the way to go. Kreg, Incra, Osborne, just to name a few, I now believe they are all better than any MDF or plywood sled I could make, accuracy wise. I have this same setup and don’t have a traditional crosscut sled. I’ve found it works for the type of projects I make. I’ve even used the 1/2 degree increment feature which I never thought I would use. I always use a sacrificial backer board to reduce tearout and replace it every few months. Glad it is working out for you! Great to have a customer base. Helps to pay for the better tools. Time is money in production. Hope everything continues to go well. Am I missing something or are you flipping the board over after each cut? That kind of ruins the grain pattern on nicely figured wood kept in order?? Accuracy of coarse is great but I get good results setting two angles with a draftsmans triangle. And 4 shorter guides under the sled that fit tight and waxed help on a wooden sled. just mho. I just wish someone would make a good 45 degree sled for cutting miters easily. So far my home made sled for 45’s is all I got…but it does work beautifully. thimmaker: I am flipping the board over every cut. For 99% of my wood, it is not an issue. Yesterday, I did cut some flame maple for accent pieces in a ring, but it was flamed on both sides. If I need the grain exactly the same on a given ring, (so far I am new enough to this it is not an issue), I just cut as normal but separate them into two stacks, one side and the other side of the board. Save the one stack for another ring. ellen: Now that I have the Incra 1000HD, I don’t have to use the Miter Express sled with it, I can just pull the miter out of the sled and put it into my table saw, (may have to readjust the slop rings in the miter slot bar), and have any degree I want with good accuracy. I have parked all my sleds into my wood room and out of my shop. I know I have some mirror frames coming up, so I will also be using this for frame work. Ever considered the Miterset? Works with your stock miter gauge. I passed first since they do .5 degree at best. Since I do a lot of 16 segment rings, (don’t know why, just like that number), I needed 11.25’, which the Miterset cannot reach. And I liked the .1’ setting gauge on the Incra 1000HD. It allows for virtually any amount of segments, no matter how odd. The other thing is I did not see any provision to tighten up your miter slot bar to eliminate slop from the bar and changes your angle a tad. I don’t own one miter that does not have some slop when in the slot, until I bought the Incra, which has provisions for that. I have had absolutely no play in my Osborne sled. I bought one for my son about a year ago and his is also rock solid. The only way I can imagine any play in this design would be in an over-drilled detent, in which case I would go back to the mfg. about a defect. The basic triangulated design is very rigid. The dubby (In-line Industries) was also dead on accuarate but when I bought a new table saw I needed a clarification on their measuring system and four emails/phone calls went unanswered before I bought the Osborne. Did you look at the Incra 5000 sled? What is the difference from the express? The only way I found the Incra 5000 was with the combo pack, which has the Miter 1000SE included with the sled. I wanted the 1000HD, so I bought the Express, which is the sled alone, and added the 1000HD. I see the HD has way more set stops than the SE. You think Incra would let you pick the Miter gauge to go with the 5000 sled…I wonder if Rockler will let you swap one for the other? I don’t think so. The Incra 5000 combo pack is all most people who do furniture building and other mostly traditional woodworking need. It is the segmented turning people using those really odd angles that really need the crazy number of indents in the 1000HD. Hence, it is about $30 more if you just buy the miter, I think. In addition, like I said in an earlier post, I was able to dial in a 16 segment ring, which calls for 11.25’, first time, no air gaps in the segments, no sanding needed. Just incredible. My guess is if you want the larger sled, you can buy that alone, and then whatever miter like I did with the Express.